To understand a Cleveland fan, or just the sports landscape of the city itself, out-of-town and national writers must feel obligated to offer up the preamble. Before any success can be achieved or any praise be given, we must be reminded of the failure, or is it failures? It seems like either could work, and we’ve reached the point where we’ve got a preamble to the preamble. It starts along the lines of, “Cleveland fans don’t want to see this, but…” Then, we’re reminded of our history. It’s just the bad stuff, but that’s really only because all of the bad stuff prevented any of the good stuff from happening. Such is life, with the 2015 NBA Finals, or so it would seem, but first, let’s get everyone caught up on what we’re talking about. Sometimes, it starts in 1954, in Game 1 of the World Series, and sometimes they don’t go further back than 1980, when Brian Sipe called the dreaded Red Right 88 play in the huddle. There are some legitimate takedowns, by legends of the game, and there are some really messed up things mixed in, the type of messed up things that only happen to Cleveland. Vic Wertz batted .500 in the 1954 World Series, and went 4-for-5 in Game 1, a home run shy of the cycle. His first inning triple plated the only two runs the Tribe would score against the New York Giants, but the focus is always more about the one time he was retired in the game. In the top of the eighth with runners on first and second in a tie game, he belted one to the deepest part of the Polo Grounds, high over the head of Willie Mays. Of course, Mays made a historical defensive play. Nobody scored in the inning, and Dusty Rhodes knocked a Bob Lemon pitch over the right field wall for a 5-2 Giants win. They went on to get swept in the best-of-seven series, and the franchise would not make another postseason appearance for 41 years. I can’t really tell you the story of the 1980 Cleveland Browns, champions of the AFC Central Division. Their quarterback, Brian Sipe, was the league MVP, and the team’s insistence of playing (and winning) close games earned them the nickname “The Kardiac Kids”. In the coldest game ever played at Cleveland Stadium, the Browns trailed the Oakland Raiders 14-12 in the divisional round of the playoffs with under a minute remaining. “Kick the field goal,” the hindsight advice of fans old enough to have lived it, for Sam Rutligliano, the Browns head coach at the time. It wasn’t quite that simple though. The Browns were a mess kicking the football; they’d left as many as ten points off the scoreboard that day, between missed kicks, a block, and a botched snap. On the 13 yard-line they had time. Legend has it the play, Red Right 88, was called with a specific stipulation that if Ozzie Newsome was not wide open, Sipe was to throw the ball into Lake Erie. I’ll be brief. 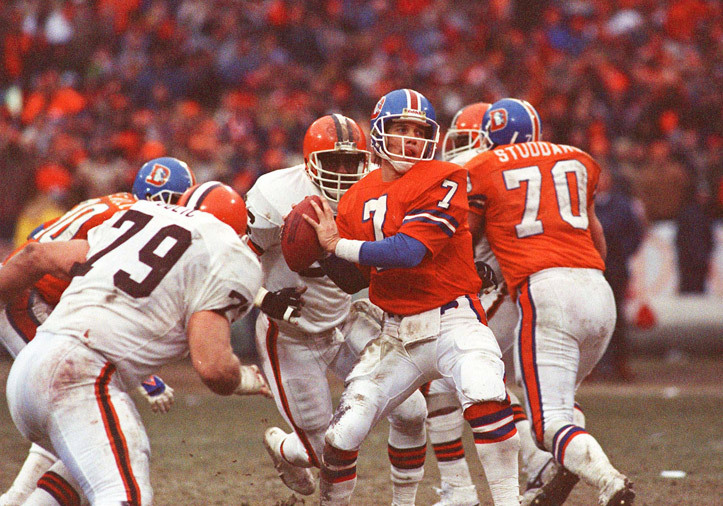 John Elway versus the Browns, with a trip to the Super Bowl hanging in the balance. The first one was in Cleveland, in January 1987. Bernie Kosar hit Brian Brennan for six, and the Browns led 20-13 with less than six minutes to play. The Broncos fumbled the ensuing kickoff, and Elway had to operate, starting at his own 2. It took them 15 plays, and there were 39 seconds on the clock when he hit Mark Jackson from 5 yards out to set up the inevitable game-tying extra point. They faced third down just three times, Elway scrambled twice for 20 of the 98 yards they had to cover, and though he was actually sacked by Dave Puzzuoli on the drive, he hit Jackson for 20 yards on the next play. It was 3rd and 18 at that point, it was that kind of drive. We know the pill as “the pill”. This was “The Drive”. A year later, the venue changed. The Browns were in Denver with the same stakes, one year later. The Broncos seemed well in control of this one, through the first 30 minutes of play, leading 21-3. It didn’t look as though this game was destined for the type of dramatic finish we’d seen the year before. 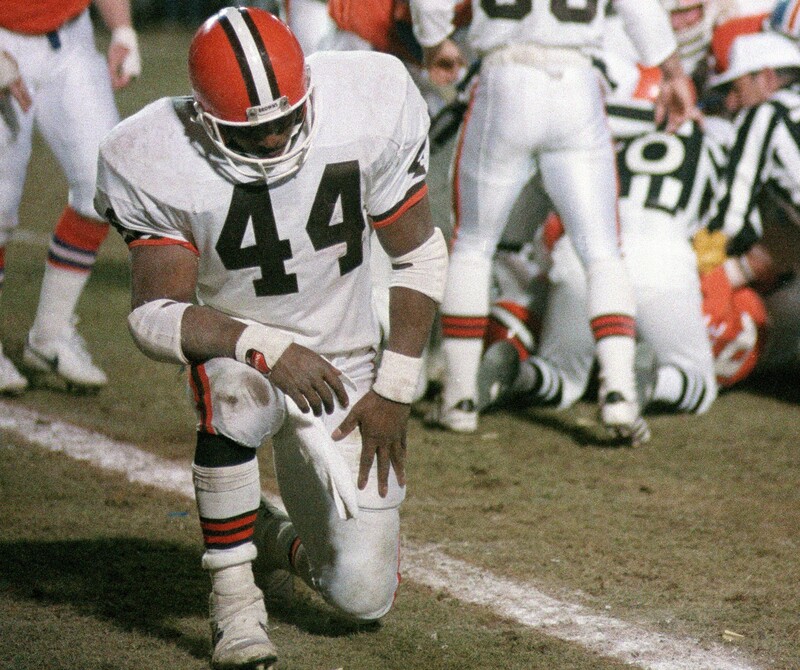 However, Bernie Kosar, Earnest Byner, and the Browns came to life in the second half. Byner accounted for 187 yards of total offense, and scored two of the team’s four second half touchdowns. Near the end of regulation, Byner’s 15th carry of the day was a draw play from the Denver 8 yard-line. He went left, where Webster Slaughter should have paved the path for Byner to get his third score of the day, but Slaughter decided to be an observer, instead of a blocker, giving Jeremiah Castille the chance to make a great play. He stripped the ball, and if you weren’t pulling for the Browns, there was probably something poetic about Elway and the Broncos at their own 2, the spot on the field where history began the year prior. So, that’s “The Fumble”, but maybe not the ultimate fumble. People in Philly might recall a game involving Herm Edwards at The Meadowlands. The Browns and Broncos also met in the 1990 AFC Championship, but that particular Browns season-ending disappointment didn’t have a defining moment, not one worthy of a well-known nickname anyway. In most of these cases, the blame falls on a player that Cleveland wouldn’t have been there without. Okay, nobody is blaming Vic Wertz for Mays making that miraculous catch, but that was the only time the Giants kept him off base all day. He even hit a leadoff double in the top of the tenth, but they couldn’t get him home. The Browns’ Dawg Pound defense had held Elway and Company to 216 yards, a number matching Cleveland’s primary area code, before yielding 158 yards between “The Drive” and overtime. We’ve detailed Byner’s great game; it’s a shame that it’s always forgotten. File this one under “Made out to be a bigger deal than it actually is”. The year was 1989; the Cavs were the 3 seed in the East, facing 6th-seeded Chicago. Craig Ehlo had 24 points, but his final points came on a lay-up with 3 seconds left, which put the Cavs on top of the Bulls 100-99 in a decisive Game 5 (of the opening round). Michael Jordan split through Larry Nance and Ehlo to receive the inbound pass from Brad Sellers on the right wing. Ron Harper gave chase, but his momentum carried him towards the sideline, so it was up to Ehlo to stay with Jordan. Jordan dribbles twice to his left, double-clutches, and hits from the top of the key. Bulls win, 101-100. Now, Jordan absolutely terrorized the Cavaliers his entire career, and I’ve seen enough Nike and Gatorade commercials to understand that was a defining moment for Mike, but for the Cavs? Not really. Chicago would defeat New York in the conference semifinals, but couldn’t get past Detroit. Now, I’m one to get upset at anyone that automatically dismissed any chance the Browns would have been able to beat Parcells and the Giants in Super Bowl XXI, if not for the drive, but those Cavs weren’t beating the Knicks or Pistons. No way. That was “The Shot”, positively devastating in the moment, and obviously a great moment in Jordan’s career, but some perspective should remind us, this was an opening round loss. It would be many years in the future before the Cavs would directly or indirectly stick the dagger in the heart of the Cleveland fan. In Game 7 of the 1997 World Series, Indians manager Mike Hargrove needed Jose Mesa to get three outs, to protect a 3-2 lead in the bottom of the ninth in Miami. The Marlins plated the tying run, before Mesa could get the third out. He got the hook in the tenth, and then Edgar Renteria singled off Charles Nagy in the 11th, scoring Craig Counsell, and giving Florida their first World Championship in baseball. For four years, Cleveland connected Art Modell and Lebron James, as the names sat as 1 and 1a on the list of public enemies on the North Coast. Modell took the one thing that Cleveland has always loved the most, their beloved Browns, to Baltimore in 1996, after a struggle with the city of Cleveland over stadium renovations. James left the Cavs in Cleveland, but took his talents to South Beach, and he did it in a tasteless matter on ESPN. Modell passed a few years ago, with a Super Bowl ring, but the clock ran out on any thought of redemption from the city where he spent 35 years of his life. He was exiled from the area, when rumors of “The Move” began in November of 1995. On July 11, 2014, in a very classy manner, Lebron told the world he was returning to Cleveland. He didn’t promise a championship, something he did in first go-round with the team, and didn’t deliver. When he left for Miami, he was called a quitter, both for his performance in Game 5 of the 2010 Eastern Conference Semifinals and for leaving before making good on his stated goal. When he announced his return, he charmed even the cynics who didn’t claimed they didn’t want him back. So, he’s back, back in the good graces of the fans and back in the NBA Finals. This is his fifth straight year in the Association’s championship series. He didn’t do it alone, something that can certainly be said about the island he was on in his first seven years with the Cavs. He replaced, perhaps even upgraded, Chris Bosh and Dwyane Wade with Kevin Love and Kyrie Irving. Of course, David Griffin should earn some credit for convincing James that a team could be built for him, but it’s very likely that nothing, except maybe the Irving extension, happens without Lebron coming home. They had their rough patches, but were able to recover and land the #2 seed in the Eastern Conference playoffs. 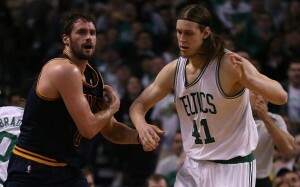 Then, it began in Game 4, with a tug on Kevin Love’s left arm. Love, out for the remainder of the playoffs. He was big in that Boston series; they might not have swept that series, against a really dismal Celtics team, if not for his contribution. As the playoffs went on, a lot of the regulars got banged up. Iman Shumpert’s shoulder was a problem. James hurt just about everywhere, but promised there was no chance of him missing time in this postseason. Kyrie Irving had a foot injury, then a knew injury. He was able to sit for a few games in the Eastern Conference Finals, as Atlanta posed no threat to beat Cleveland, even without Irving on the floor. Head coach David Blatt gave Irving some minutes in Game 4 of the Conference Finals, where he logged 22 points in a 118-88 series clinching win over the Hawks, before an 8-day layoff, leading up to Game 1 of the NBA Finals. In an Opening Night loss to the Knicks, the Cavs started James, Anderson Varejao, Love, Irving, and Dion Waiters. James will play in Game 2 of the Finals. Dion Waiters was traded to the Oklahoma City Thunder in the middle of the season, and the other three will likely be in street clothes due to injury for the remainder of the series. In Kevin Smith’s clerks, our main character tells anyone that will listen that he’s not even supposed to be here to day, and that’s how Cleveland has to feel after what went down in Game 1 against the Golden State Warriors. It was a game of runs, pretty much what you’ve come to expect from a couple of championship-caliber teams, but the Cavs had a golden opportunity with 24 seconds left and the game tied at 98. With Lebron James on your side and an opportunity to score as time ran out, you had to like Cleveland’s chances. Lebron had 42 at that point. It was a bad possession. James found himself pinned against the sidelines on the left wing, and took an ill-advised jumper with 3 seconds left. Shumpert grabbed the rebound and heaved the rock at the rim, and we’ll tell you, it almost went in! In reality, it missed and we got 5 minutes of bonus basketball in Oakland. The extra period belonged to the home team. They outscored the Cavs 12-2, basically shutting them out until a meaningless lay-up from James in the final minute. Yes, Cleveland played a poor five minutes of basketball, but losing the game may not have been the top story, and that’s saying a lot for a championship series. For a while now, Irving has been playing bent, but not broken. Maybe he was broken, but just not broken enough to be a spectator, this deep into the playoffs. Early in the overtime period on Thursday, he left the floor, in what can only be described as visually unbearable pain. On Friday, it was announced that Irving was not only out for the series, that he’ll require surgery, and will be out for four months. Down 1-0 in this series, a lot of people are looking at Game 1 as a blown opportunity, and without Kyrie Irving, many are ready to hand Golden State the Larry O’Brien Trophy already. Man, if only that Shumpert heave would have found the bottom of the net! In Cleveland, they’re already trying to figure what to call this episode of the Cleveland Sports Misery tale. Done in by unworldly performances on the other side of the field, made to regret some gaffes that professional athletes just shouldn’t make, and slighted by damning personal and business decisions, that’s what fills up the misery montage in the present tense. This is different, this is new. You’d almost think it was funny, if it wasn’t so damn sad. Never have I seen injuries derail a Cleveland team quite like this, and I can’t recall a contending team in any sport lose two of their three best players in a single postseason. Vince Coleman’s tarp accident during the 1985 National League Championship Series comes to mind, but that comparison might be a stretch. There might even be others, but we cannot recall anything as bad as whatever you might label the unfortunate events that have plagued these 2014-2015 Cleveland Cavaliers during these playoffs. There are a lot of reasons for Cleveland to very pessimistic about all of this, but they should remember #23 is still going to fight. They should remember those years of rooting against him in Miami, and how upset we were when he inevitably got it done for the Heat. He’s still the best, and might be able to will this squad to four wins. 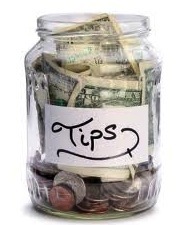 To definitively say that will or won’t happen would be a mistake, but it’s hard to bet against Lebron. It would be foolish to say it isn’t a possibility. He lost twice in Miami, and he’s lost plenty in Cleveland. We’ll tell you something else that is inevitable, we’re going to see a wincing Kevin Love and a limping Kyrie Irving in that montage, if Cleveland and Lebron can’t find a way. If not, that montage is getting longer, and we already feel it’s too long. Then, you know someone is going to name this latest fiasco. Of course, the alternative is winning, and then we probably won’t see the Cleveland Sports Misery montage at all. That’s a dream 51 years in the making.